At least six publications have had to close in recent months and around 30 journalists have fled abroad since the start of the year as a result of the biggest crackdown on the privately-owned press since 2005, one reflecting a government desire to make a clean sweep of independent media before parliamentary elections next May, local analysts say. In the latest development, Reporters Without Borders learned on 1 November that magazine editor Temesgen Desalegn has been transferred to a prison in the town of Ziway, about 200 km away from Addis Ababa to serve the three-year jail sentence of his 13 October condemnation. Desalegn was convicted of publishing reports about “politicians and journalists linked to terrorist groups” in the now-closed newspaper Fitih, which he edited before becoming the editor of Fact, a magazine closed in August. These charges were dropped after originally being brought against Desalegn in connection with a defamation case in 2012, but were revived last year. “We are extremely concerned about Temesgen Desalegn’s conviction and his transfer to a prison far from his family, especially as he has chronic health problems,” said Cléa Kahn-Sriber, the head of the Reporters Without Borders Africa desk. Desalegn’s trial and conviction have been preceded by many other acts of intimidation and harassment that have created a state of extreme fear within the Ethiopian media. The owners of three magazines – Endalkachew Tesfaye of Addis Guday, Gizaw Taye of Lomi and Fatuma Nuriya of Fact – were convicted in absentia of “encouraging terrorism” on 7 October and were given sentences ranging from three years and three months to three years and eleven months in prison. The source of the charges was the justice ministry, which has brought the same charges against three other publications – Enqu, Jano and Afro-Times – whose fate is not yet known. Even public media are not spared when they stray from the party line: in June, 18 journalists were fired by the main state-owned broadcaster in Oromia, Ethiopia’s largest region, because of their political views. In April, six bloggers with the Zone 9 collection and three journalists – one a freelancer and the other two employed by privately-owned media – were arrested in the course of a single weekend without any explanation being given. It was only after they had been held without charge for three months that they learned that they were to be prosecuted under the 2009 anti-terrorism law for allegedly “organizing themselves into covert sub-groups to overthrow the government by contacting and receiving finance and training from two designated terrorist groups” – a charge that carries a possible 15-year jail sentence. Since then, all their requests to be released on bail have been denied. “We call on the authorities to reverse these convictions of journalists and media owners on specious grounds in recent months and to withdraw all the charges against the news and information providers currently jailed or in exile,” Reporters Without Borders deputy programme director Virginie Dangles said. A smear campaign against a number of independent newspapers began in January when the government newspaper Addis Zemen published an Ethiopian Press Agency study listing articles they had published that allegedly promoted an uprising and terrorism. 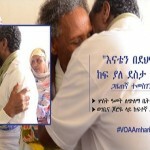 In late August, state-owned Ethiopian TV broadcast three documentaries, including one entitled “Untamed Pens,” that portrayed the staff of the magazines Lomi, Fact, Enqu, Jano, Addis Guday and the newspaper AfroTimes as enemies of the state. This documentary aims at justifying the charges brought against these publications. In the weeks before and after this documentary aired, several media were closed down and their employees threatened or harassed. Seals were placed on the entrance to Lomi’s office on 19 July – on the grounds that it did not have a licence to operate – and the police searched it thoroughly. Ethio Midhar, a newspaper, was closed in October and its editor was summoned for questioning by the criminal investigation division, known as Maekelawi. The companies that print certain newspapers, such as Ethio Midhar, Addis Guday and Lomi, have also been harassed by the authorities, as a result of which they are now refusing to print them. Many journalists have reported being summoned by the police and threatened with arrest or physical reprisals. When the police could not locate them, they threatened their relatives with arbitrary arrest or raids on their homes. All this harassment and intimidation has created a climate of terror within the media community that has driven about 30 journalists to flee the country since the start of the year. The entire staff of some publications has fled abroad. They include Lomi, whose editor, two of its reporters and six other employees fled abroad as soon as the judicial proceedings were initiated. Many have gone to the Kenyan capital of Nairobi, which Reporters Without Borders visited last month to interview them about their life in exile and the way they were persecuted in Ethiopia. With no source of income, they have had to endure the most appalling material and psychological conditions in Kenya, and fear being followed by the Ethiopian embassy’s agents. Despite the extremely precarious situation awaiting them, journalists are continuing to flee Ethiopia. Another newly arrived journalist said: “Other colleagues are thinking of joining us. The legislative elections are coming and they know that the climate will continue to deteriorate.” One journalist, Million Shurube of the newspaper Maraki, fell ill during the journey and died in exile for lack of treatment. Observers of the situation in Ethiopia say this is the worst crackdown since the one that followed the elections in 2005. Although its economic and social record has been relatively satisfactory in recent years, the Ethiopian government seems to fear any form of criticism or protest at a time when ethnic and religious-based demands are growing. The privately-owned press is clearly experiencing its most difficult period in a decade even if some publications, such as Reporter, Addis Admas and Ethio Miska, are continuing to appear. Publications that did not originally intend to cover politics felt obliged to evolve because of a pressing public demand for more diverse coverage of political and social developments. And sometimes their staff took radical positions that failed to respect media ethics. But, according to the information obtained by Reporters Without Borders, none of these media ever published articles that justified the current crackdown. The government’s aim is to clear – to install such a level of fear that it will not be challenged. According to Reporters Without Borders’ tally, at least ten journalists and six netizens are currently detained in Ethiopia, which is ranked 143rd out of 180 countries in the 2014 Reporters Without Borders press freedom index. Posted by cybereth on Nov 8 2014. Filed under News, Views and Opinions. You can follow any responses to this entry through the RSS 2.0. Both comments and pings are currently closed.